Long time ago, there was a powerful dragon called Baruklinting. The dragon meditated with opened mouth. His meditated would be end when there were nine shepherd boys came into his mouth. Not far from his place, there was a little village where live ten shepherd boys who always shepherded their cows every morning. One of the ten shepherd boys is very disgusting, his body full with ulcers. His friends always evaded and humiliated him. His name was Samin. One day, the ten shepherd boys went out, shepherded their cows. Samin had a cool and shady location and full with fresh green grass. The nine shepherd boys became very unhappy because they only had field with shrubs. They tried to make Samin and his cows went away so they could shepherd their cows in that grassy land. "How should We do?" said Paijo. For a while they tried hard to find a solution. Finally, the older boy, Gendon, had an idea. "Guys, I have a good idea. Why don’t we throw him with dung of our cows?" said Gendon. They agreed with Gendon’s idea. They began to throw Samin with dung of their cows. Samin still tried to be patient getting such miserable humiliation He knew what they really wanted. So He let them take the grassy land off him. Suddenly, the sky became grey and lot of lightning and thunder flashed and shot down the earth. The rain fell down hardly. 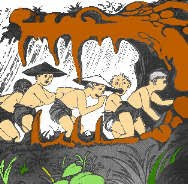 The ten boys looked for covered place without bordering their cow condition anymore. In that day, Samin had a second bad experience again. He found a cave to protect itself from a rain. In the cave, there was many sharp stalagtites and stalagmites. However, the nine boys came in and kicked him away. When Samin came out the miracle happened. The mouth of cave was closed by itself and the rain suddenly stopped. For a while Samin was not realised what really has happened. When he has realised there was a tremendous dragon in front of him. Samin ran hurriedly back to the village, he told what has happened to the people in his village. The people agreed to kill the dragon, they brought all the weapons they had. However, when they arrived to the place where Samin told, there was no dragon or even his trace either. The people finally believed what Samin has seen is the Baruklinting dragon who has finished his meditation. And the sharp stalagtites and stalagmites were the dragon teeth. All the parents of nine shepherd boys felt sorry for their son. After that accident, that village became famous and called by the people as Kesongo village. Kesongo means nine. It remembered us to nine shepherd boys who has been eaten by the dragon.